You're finally ready to admit it. Good for you! That's it! Really?Yes, a pet weight loss plan is as simple as that. It takes some planning, work, and determination. But everything you put into it is an act of love towards your dog. You are quite possibly saving their life. According to the Journal of Veterinary Internal Medicine, between 60 & 70% of owners of fat dogs don't think their pet is fat. Just by reading this article, you are already ahead of the pack! 1/8 lb. to 1/4 lb. 1/4 lb. to 1 lb. 1/2 lb. to 2 lbs. oCheck the Bag: Always look at the food packaging. Remember that the recommended serving size is for the WHOLE day. Not for each time you serve the dog food. oReduce Serving Size or Change Foods: If you chose to reduce the amount served, start with a 20-30% reduction.If you are looking for lower calorie food, be careful. Many "low-cal" foods just substitute in lower calorie carbohydrates. To safely loose weight, dogs need food that is high in protein. Look for "active weight loss" formulas. The first ingredient should ALWAYS be meat. Not soy, or corn, or wheat. oCut Back on Treats & Table Scraps: Treats should make up no more than 10% of your dog's total caloric intake. Yes, giving treats is fun. We all love that waggly tail happy dance around the biscuit jar. But there are other ways to show love and elicit excitement. Try rewarding with exercise, new toys, or extra affection. Try to only give treats when they are earned, not just randomly through the day. Try switching to lower-calorie snacks or start breaking them in half. Handing out table scraps can encourage begging, and human food is often too high calorie for dogs. It's best to break the hand-out habit. 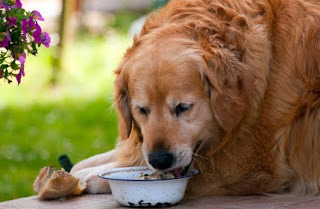 oSmall, Frequent Meals: Feeding your pet small meals throughout the day can keep hunger at bay. Try breaking the daily serving into 2-4 smaller meals. If you are leaving out a giant bowl of food for dogs to "graze" on all day, stop this altogether. 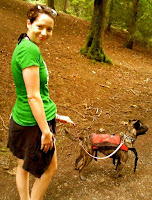 oStart Gradually: Over-exercising an out of shape pet can be very dangerous. Start slowly and work your way up to your goals. Make sure to take your dog's current condition into account.A good place to start is with daily on-leash walks 5 days a week. Start with 20 minutes per walk and gradually increase by 5 minutes every other week. You'll be up to an hour in no time! oLook for Fatigue: Make sure to keep a close eye on your dog. Heavy panting is a sign of possible fatigue or over-heating. On warm days, try walking in the mornings or evenings. Make sure to have water on-hand if you are far from home. oAdd In Alternative Exercises: Swimming is a great activity for old or very obese dogs because it's easier on the joints.Take your dogs along for hikes or walks on the beach. Schedule in daily games of fetch.Attend Doggie & Me Bootcamps. Arrange for play dates with other friendly pups. Hit up the local dog park. Anything to get those paws moving! oConsider a Using a Dog Walker: If your own health or schedule are not conducive to regular brisk walks, consider hiring a professional. If you're concerned with the extra cost, just plan to use them until the extra pounds come off. In the long run, a healthier dog will save you money at the vet's office. Should I consult my vet?It's always a good idea to consult your veterinarian before starting a weight loss program. They may want to test your dog for underlying medical causes of the weight gain such as hypothyroidism or gastrointestinal problems. They can also help you set a reasonable goal weight and recommend specific foods that are best for your dog. It's up to you to stick with it! We know you can do it!